Last night, Aaron and I celebrated our 6th Anniversary of being a couple. He brought me some very pretty flowers, I finally gave him the Ecco shoes I had been dying to give him for a week and we went out to an unbelievably, awesomely tender delicious steak dinner at Boboquivari's (Bobo's) in the Marina. The word is that Bobo's is only one of three places in the US that dry-ages its steak for several weeks and the only one on the West Coast, which sounds scary, but it was honestly the best steak I've ever had in my entire life. Both Aaron and I got the bone-in fillet mignon, which is Bobo's specialty since they have to special order that cut because they have to break a bone or something, which ruins the New York steak cuts that usually come from that part of the cow. (The manager gave us a long explanation). The service was great, the wine list is extensive and has great choices, and the desserts look fabulous. 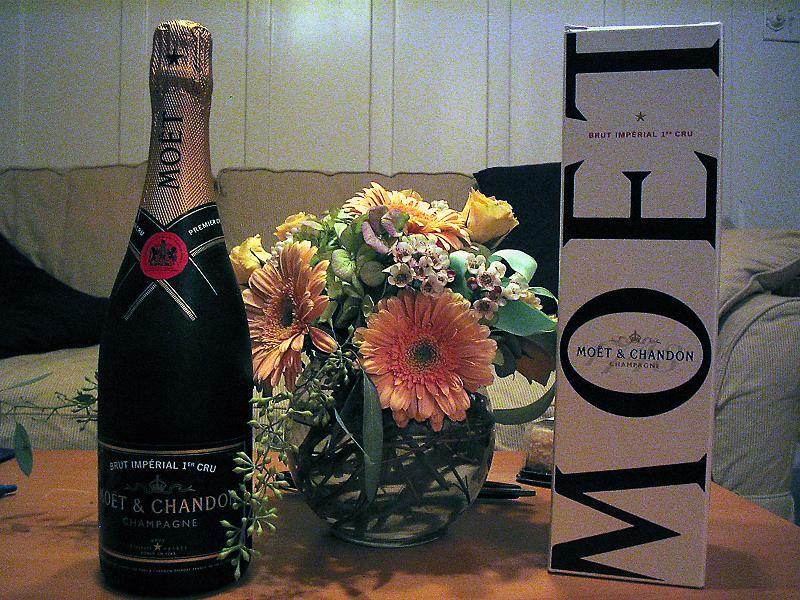 However, we skipped dessert because we wanted to get home and drink the bottle of Moet&Chandon 1er ("Premier") Cru that I purchased at the Moet&Chandon cellars over the summer. "1er cru" (best translation, if that's possible: "first growth") refers to the class of grapes that are used in the champagne. 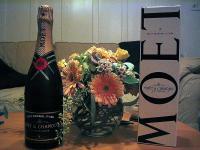 "Grand cru" grapes grown in the Champagne region are reserved for the finest champagnes and are also aged the longest. Dom Perignon is made solely of grand cru grapes and aged from 6-8 years. 1er cru is the next level of grape. Vintage champagnes are a mix of 1er cru and non-rated (yet still high quality) grapes, aged for 4-6 years and regular champagne is this same mix aged only about 2 years. So, this 1er cru bottle I got is only aged 2 years but made solely of the best grapes you can get outside of Dom. I've been talking up this bottle ever since I got home to the point where Aaron was almost sick of it, but it did not disappoint. It was crisp and sweet in the perfect amounts, making it sweeter than the brut or a vintage M&C, but not overly sweet the way some champagnes can get. I've tried to find this bottle in Bay Area wine stores or on a US website and haven't had any luck, but it seems available from UK or French websites for about $40US. Anyway, we had a great anniversary and I couldn't be happier. Yesterday was also my mom's birthday and we had invited her to join our fabulous Bobo dinner for her special day, but she's been ill so I'll go visit her today. Happy B-day mom! Lastly, today is Jessica's B-day, so I'd like to give a B-day shout out to her, too! Oh... I almost forgot... Happy Anniversary Dr. V!